In the last 15 years the amount of data produced by an average construction project has exploded. In an effort to improve project outputs, we have really embraced software systems across the design, procurement and construction across the construction process. All indications are that this will increase in the near future. Let’s look at the purpose of Project Controls. In order to fulfill the purpose as outlined above, project controls must gather the projects data, combine it into a meaningful data-set and use that data to make better decisions. There are a range of business intelligence tools available that can help create excellent project control systems. The traditional approach to Business Intelligence is that an integration specialized is hired to create project data-set that incorporates all the data sources available on the project. They define the scope, integrate the software products and create a range of reports for the different stakeholders on the project. In theory this works great, however in practice the resulting data set, project reports and software system integration often does not go well over the life of the project. Projects changes, software use changes and the data can become a poor sources of project decision making. The end result is that the management decisions are made from a handful of isolated database systems and a maze of data spread through a thicket of excel work books. In project controls, we shake our heads and say, “our data-sets should be better, if only clients would pay more for better data systems.” A cleaner more reliable data system always seems about 10 years away. Interestingly, the engineering and construction world is not the only one that runs out of an excel workbook. Lots of other industries do as well.In fact, most people seem is a little bit sheepish about the final data-set that they use to make decisions with. Microsoft have noticed this. The product that they have been pouring massive amounts of resources into over the last four years is called Self-service Business intelligence. The idea is that the tool sets allows skilled data savvy knowledge workers to develop simple solutions to Understand (Power BI), React to (Power App) and Automate (Flow). The Power Suite set of tools are designed to sit between current business databases and the front line business work force and increase understanding of data. There are a lot of business intelligence tools in the market. In my mind the game changing feature of Microsoft’s Power BI software is its integration with Excel. Excel is the world’s most popular data and coding tool, the most used button on almost all database systems is export to Excel! There are two amazing data analysis products that now ship with all new versions of Excel. You probably have them on your computer right now. They are at the heart of Power BI and they can add value to your workflow by just using Excel. Power Query is Excel’s data cleaning and transformation tool and it is available in the Data ribbon of all new versions of Excel. This is an amazing add on. It has the ability to carry out complex data manipulations and integration all on its own. This is by using the clean, simple interface that you can train your colleagues on or by using the coding features that sit under the applications hood. Power Pivot is a data modeling tool that takes your cleaned and shaped data from Power Query and allows you to create a linked data set that allows for analysis between data sources. Power Pivot can handle millions of rows of data and depending on your skill with the query language DAX, you can create very complex reports that answer the questions that your teams has about your data. The two tools Power Query and Power Pivot are a game changer for project controls. They allow for comprehensive integration and report generation using existing industry tools such as Primavera P6, right from the Excel environment. If the team decides to do more with the data the Power BI visualization environment can share and control access to the data and create a range of easy to create understandable dashboards. The process is not easy and it will take time to learn the skills but the tools are there. Instead of farming the data work out to third parties who know very little about project environments, these tools allow the data integration effort to remain in the project controls group. As the complexity of design and build tools increases, 4D BIM, 3D modeling as examples, the data will arrive in larger amounts and the industry will have to create reports and analysis faster than ever before in order to extract value from these systems. I am suggesting that Power Query and PowerPivot are key tools in creating a data savvy Project Control team. Most project control professions are already excel “Power Users” and using the self- service tools in the excel environment is the next logical step. Microsoft are really serious about creating cloud based tools that will allow businesses to get more from their data. I believe that Power BI and its two main data tools Power Query and Power Pivot can add real value to most project control efforts. 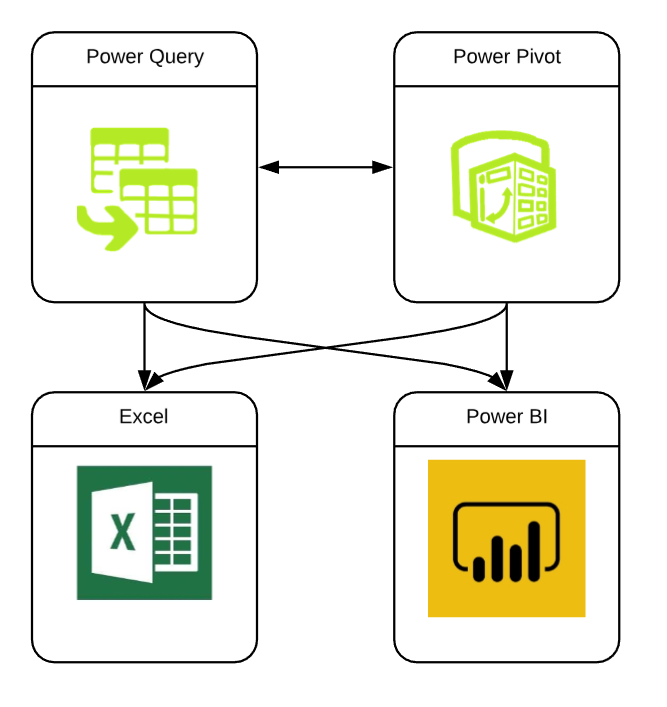 Power Query and Power Pivot allow you to create useful data tools with your existing data right away and the availability of the Power BI ecosystem means that you can grow those efforts in to fully functional enterprise systems when you are ready. It’s quite an offer, tools that will help you with your monthly report next month and the ability to scale that report to 20 – 30 people using the same technology. The allows project control groups to meet their reporting obligations right now and also build data skills that can be used in the future. Best of all Power Query and Power Pivot is probably already installed in your version of Excel. Spend less time on mind numbing data entry and take control of your project data!